What Can School Teams Learn from Geese? My last two posts have been reflections on what I've learned this fall about the role that teams can play in transforming schools. The final installment in this series is not original -- I didn't come up with these ideas -- but just in case you haven't come across "Lessons We Learn from Geese," I wanted to share these. There are many versions of this all over the Internet, all of which say, "Author unknown." Here's a version I like. 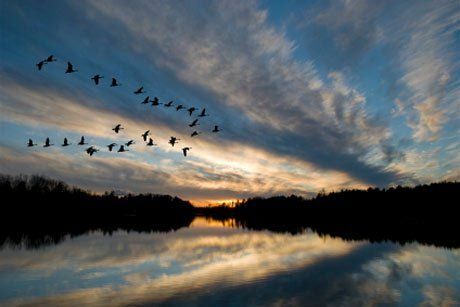 During the fall, thousands of Canada Geese migrate from northern Canada to the central U.S. They fly in a V-formation at speeds of 60 miles per hour, honking constantly. They can fly for 16 hours without resting. How do they do this? Through teamwork. So what can we learn from these geese? Fact: As each goose flaps its wings it creates "uplift" for the birds that follow. By flying in a "V" formation, the whole flock adds 71 percent greater flying range than if each bird flew alone. Lesson: It pays to take turns doing the hard tasks and sharing leadership. As with geese, people are interdependent on others' skills, capabilities and unique arrangements of gifts, talents or resources. Lesson: We need to make sure honking is encouraging. In groups where there is encouragement the production is much greater. The power of encouragement (to stand by one's heart or core values and encourage the heart and core of others) is the quality of honking we seek. I often offer this to teams as they begin working together. "What resonates for you?" I ask. Everyone loves the idea of honking at each other for encouragement. In one school, a teacher (who could be a little cantankerous) suggested that when attending staff meetings, everyone wear hats reading, "We're the honkers, not the honkies!" On many occasions teachers at that site began honking like geese at moments in which they wanted to cheer for each other (a little odd looking, but very meaningful for them). What resonates for you? Have you ever worked at a site where the wisdom of geese was at play? What other symbolic representations of effective teams are moving to you?